The federal minister of state for education and trainings, Engr. M. Baleeg ur Rehman has said that access to modern technologies is necessary for students in order to fulfill educational pursuits. He was speaking at the ceremony in Pakistan institute of engineering and applied sciences, which was conducted for the distribution of laptops among 231 students of MS and PhD programs in PIEAS. He said that our distinguish place in science and engineering in Islamic world is due to the efforts by the institutions like PIEAS. He added that we are proud nuclear nation and this is attained with hard work and commitment of scientist and engineers trained by the institutes like PIEAS. He further said that according to studies, the laptop distribution among students of nation narrows the digital divide and access to the computer technology helps them to move forward. The minister briefed that other countries are also using such kind of laptop distribution schemes for the students in order to better the study and research environment. He stressed that government is following merit rule in the distribution of laptops among students. He also said that PM laptop scheme was started under the guidance by PM Sharif for young and brilliant students of the public sector universities and this program actually encourages the students to further move ahead in their research and academic activities. On the occasion, the Rector of PIEAS, Dr. M. Aslam said that PIEAS attained the degree awarding status in 2000 and within a short span of six years; it got the first position in ranking and left behind the engineering universities of Pakistan. He thanked the government through the help from HEC and also appreciated the Pakistan atomic energy commission for helping PIEAS in achieving its goals. 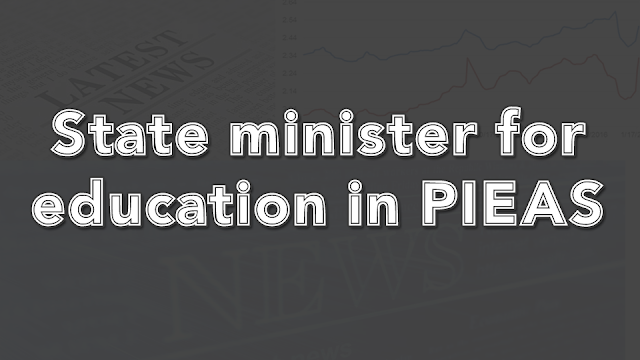 He also praised the role of faculty in the ranking position of PIEAS at highest level in HEC rankings. PIEAS ranked top university of Pakistan in QS Asia ranking of 2014 and 2015. PIEAS is the engineering university in Pakistan working under the Pakistan atomic energy commission and has 143 regular faculty members. Out of 143, 100 have gotten their PhDs degrees from reputed universities of USA, Canada, UK, France, Germany and Australia. The PIEAS every year also selects candidates from various engineering disciplines and trained them under the atomic energy fellowship in PIEAS. During the two years masters programs, the students are being given the stipend and state of the art research opportunities. After the successful completion of fellowship program, the students are given jobs in atomic energy commission.